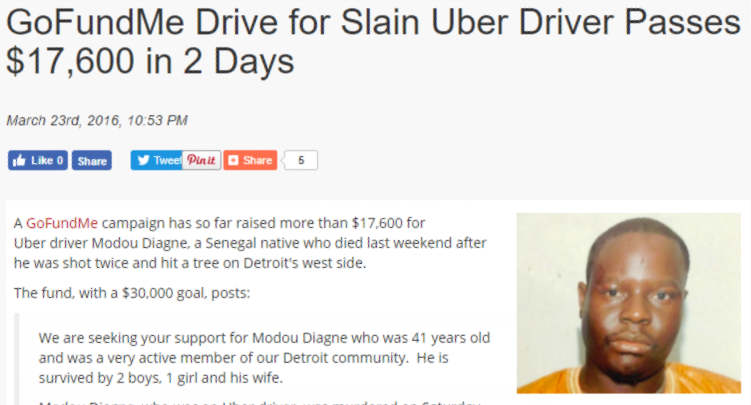 Uber driver Modou Diagne, 41 was shot and killed by his drug dealing passenger on March 20, 2016 . He is survived by his pregnant wife Batal, like himself a Senegalese immigrant, and their three children, all under the age of 6. “He was working all the time, no days off. Sometimes 19 hours a day” said his niece, Fatima Diop. Not only did his family lose its only source of income but because Uber drivers are classified as “independent contractors” rather than “employees,” they have neither the benefits nor the protections of workers’ compensation insurance. 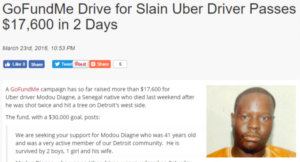 Had Mr. Diagne driven for a limousine service, he would have been classified as an employee and his family would be eligible for the workers’ compensation benefits set by the State of Michigan. Those benefits include a burial fund of $8,000 and then weekly payments to the family up to 500 weeks. Without those “safety net” benefits for rent and groceries, friends and neighbors reached out to news sites, community, and faith groups through GoFundMe the web-based fund raising site. 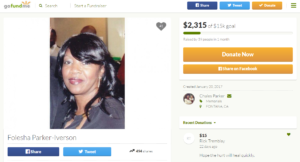 Hard working widow and mother, Folesha Parker-Iverson, 52, was employed as a high school counselor technician . Here salary was $30k plus $14k of benefits. To put her two daughters through school, Folesha became a driver for both Uber and Lyft, working late every day of the week. On January 14th, 2017 Folesha was killed by a drunk driver running a red light in the early morning hours. Her children lost the health care benefits of their mother’s day job and because Folesha was an independent contractor with Uber and Lyft, her surviving daughters would not have California’s workers’ compensation death benefits. Relatives of Folesha quickly started a GoFundMe page to support the orphaned children. 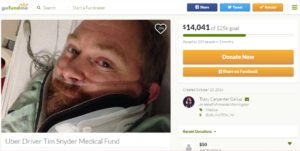 The effort was featured in several news items but within a few days the site was closed and another GoFundMe page was opened to gather more charitable contributions. 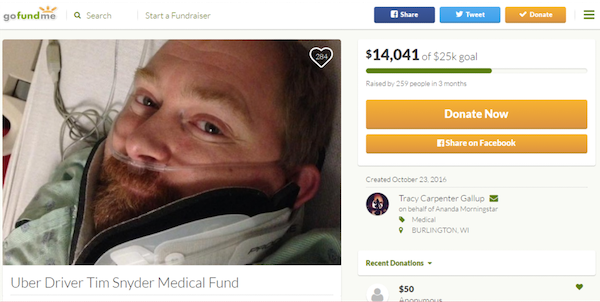 Unfortunately, the new site missed the news cycle and a month later the GoFundMe page had only raised $2,300. Professional driving is a very hazardous job classification throughout the world. Accidents, assaults, and back injuries take a toll, plus long hours sitting behind the wheel contribute to obesity, diabetes, and nerve related disorders. Workers’ compensation insurance is very expensive for companies that have drivers classified as employees, with premiums somewhere between 10-20% of a worker’s gross income. Furthermore, those premiums are based on the amount of previous claims, so drivers in especially risky work cause those high premiums to increase even more. Requiring distracted driving while using a mobile device to accept orders, find the passengers and follow the device’s routing instruction. This is especially tricky for pooled services like Uber Pool and Lyft Line where new requests come while en route with some passengers already on board. Much driving is done in unfamiliar neighborhoods, frequently in the dark . 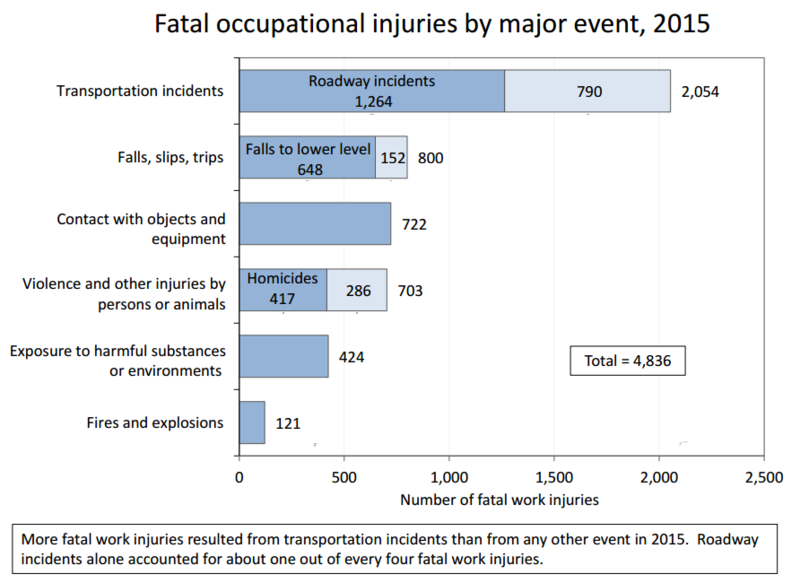 Other work is done in congested urban areas where the majority of accidents occur. Additionally many passengers request rides in the evening when they leave work and go to restaurants and bars. Afterwards, drivers go to unfamiliar neighborhoods at night with poor signage. Driving between midnight and 4 AM. This is when drunk passengers become belligerent and assault drivers, more drunks on the road crash into TNC vehicles, and drug dealing and gang crime take a toll on innocent drivers entering risky neighborhoods. This danger is not being exaggerated, not only did the three examples cited in this article occur in this high risk-4 hour period but nearly all TNC driver deaths, assaults, and robberies have happened in this time slot. This is the risky work that has caused many taxi services to install a protective barrier between the back seat and the driver. Despite the risk, drivers are drawn to work these hours because of high demand and increased rates. Most TNC work-related injuries do not result in death, but they can create a unique and vicious cycle of interrelated problems. TNC drivers frequently lose their ability to work after an injury because of the physical requirements of driving and because accidents put their personal car out of service. Loss of a family car can also keep them from finding other, less demanding work. This layered entanglement can last as long as the injury recovery period or longer when the injury results in a permanent disability. Both Uber and Lyft will only pay for damage to a driver’s car if the driver’s already has physical damage insurance and no other insurance will cover it. But it does so with high deductibles that the driver must pay themselves. Uber’s deductible is $1,000.00 and Lyft is even worse with a $2,500.00 deductible. So if a driver has an at-fault accident or an accident with another vehicle either that drives off, or that driver is uninsured/under-insured the TNC driver cannot work until the car is repaired. Therefore (1) no income, (2) a surprise car insurance bill of $1,000.00-$2,500.00, or even the full cost of the repair, and if injured, (3) a stream of significant medical bills. Even if the TNC driver has an injury accident with the other insured vehicle at fault, they are out their income stream while they wait for some sort of settlement with the other party’s insurance carrier. Most TNC drivers have no financial cushion and an injury accident frequently pushes them into bankruptcy. “Early this morning while Tim was driving for Uber his car was struck by another vehicle when it failed to stop at a red traffic light. Tim was the only survivor from his vehicle. His injuries include bleeding near the liver which he is continuing to undergo scans to determine the source and cracked vertebrae. Tim’s work is the main source of income for his family and the car lost in the accident was their primary vehicle. It is unclear at this time how much work and income will be lost due to this accident, not to mention the inevitable mountain of medical bills he will be faced with. It is easy to see that with no car, an inability to work and crushing medical costs, workers without employer provided workers compensation coverage can easily get shuffled out of the workforce, perhaps lose their home and even become homeless. Although expensive, workers compensation coverage fulfills a societal need to return the injured worker to a productive, self supporting standing, and keep them off potential public welfare programs. Worker compensation insurance for drivers is so critical that some cities require their independent contractor taxi drivers to participate in a group compensation policy even though they are not classified as “employees”. In November of 2014 Uber CEO Travis Kalanick snidely remarked that he was grateful for Obamacare. He said workers would have medical coverage without being tied to employer provided health care, freeing them up to work for companies like Uber that have no benefits or workers compensation insurance. Hey Travis, medical insurance itself only covers a portion of medical costs, additionally, for independent contractors, the full premium for health insurance is solely paid for by them. Continuing income when a worker becomes disabled from a workplace injury. 100% reimbursement for related medical costs. Therapy to enable the worker to resume their occupation as quickly as possible. If a worker becomes permanently disabled, then re-training in another skill thereby enabling that worker to again support themselves. Reimbursement for transportation costs to medical, therapy and training appointments. If the disability is permanent, then a lump-sum is paid to the worker suffering and for the loss of that income ability. Continuing death benefits for family survivors that last years after the accident. Finally, companies in risky industries are pressured by both the financial burden of worker injuries and the stipulations of labor laws and insurance policies to make safety a high priority. 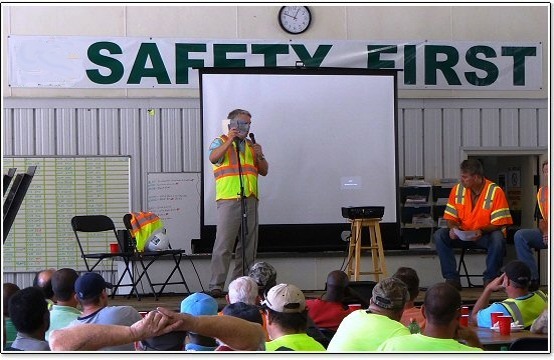 They create safety programs that include manuals and policies, safety managers, training sessions, that make performing the work safer for both workers and the community. Neither Uber or Lyft have safety programs, or even warn their drivers of unsafe practices. To the contrary, their promotion of “fun” in recruitment advertising and their written agreements with drivers and passengers that they are not responsible for whatever happens to anyone only fosters more injuries and deaths. Click here to view the Rideshare Justice Project’s list of current charity requests. Even $5.00 helps. Uber is well-known limousine service provider all around the world. They provide cheap service which doesn’t match with the security of passengers and drivers. By reading all incidents mentioned above made me disappointed. I wish all the victims come with recovery as soon as possible. I kindly request to the respected Uber to take care this tough situation. Uber Settles Driver Lawsuit for $20 Million LawyersandSettlements.comSan Francisco, CA The settlement in O'Connor v. Uber, if approved, will end a 6-year class action California labor lawsuit over worker misclassification.